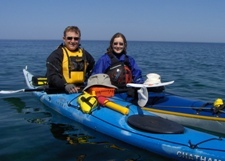 Sea kayak Lake Superior and the Michipicoten River on our guided day trips. Join Naturally Superior Adventures’ experienced guides to explore the wilderness that surrounds our Lake Superior Paddling Centre. We provide the sea kayaks, all the necessary equipment and a hearty lunch; all you need is a change of clothing. Day trips can be scheduled for any day of the week for groups of two or more. We start at 9:00 with an hour-long paddling stroke workshop before sea kayaking Lake Superior’s Michipicoten Bay, Driftwood Beach or the historic voyageur route up the Michipicoten River. We will return by late afternoon, leaving you time to enjoy your evening. Want more information? Contact us by email or call 1-800-203-9092. Great food, incredible guides and a beautiful facility.